This classic Mustang Fastback seems having some troubles and the grease monkeys are going to fix it in a few minutes. It'll be back in great shape as Ford built it. 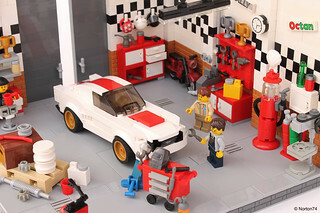 This little diorama is my second entry for LEGO Ideas contest Celebrate your favorite ford mustang in a beautiful scenery! It features all the stuff you'd expected to find in a busy shop: a roller cabinet, a workbench with wrenches and vise, the pendant lights, the column drill press, air compressor, and a lot more. There are also trophies and helmets all around. The Star Spangled Banner is proudly hanged on the wall.